The Boeing 717-200 jet does have an option for a first class cabin, as most aircraft cabins can be configured to the operators needs. A Boeing 717-200 first class cabin is located at the front of the airplane and are usually the first three rows of seats. First Class seats are configured in a two by two configuration, with two seats on each side of the aircraft. Most airlines have 37 inch seat pitch for the Boeing 717 first class seats. The airlines that are operating the Boeing 717-200 with first class seats include AirTran Airways, Delta Air Lines, Qantas / QantasLink and Hawaiian Airlines. AirTran operates the 717-200 with 12 first class seats in the first three rows. As previously announced, AirTran will be closed by Southwest Airlines and 717 flights will end on December 28th, 2014. Delta Air Lines is operating the Boeing 717 with 12 first class seats also and will be acquiring most of their 717 fleet from AirTran. The Qantas Boeing 717-200 operated by Cobham Aviation Service Australia under the QantasLink brand has their aircraft fitted with 12 first class seats. Only a few of their 717-200 jets have first class seats (approximately 3), however it looks that most of them will be converted to have some sort of first class configurations. Officially Qantas calls the first class section on their Boeing 717 jets a business class section. Hawaiian Airlines' Boeing 717-200 airplanes are fitted with 8 first class seats that are located in the first two rows. Hawaiian has the fewest first class seats out of the main operators of the aircraft. This may be due to the fact that most of their 717s only fly ultra short routes in the state of Hawaii and the market does not not support the need of additional first class seats. The majority of airlines that operate the Boeing 717-200 commercial jet have a first class section that passengers can book. 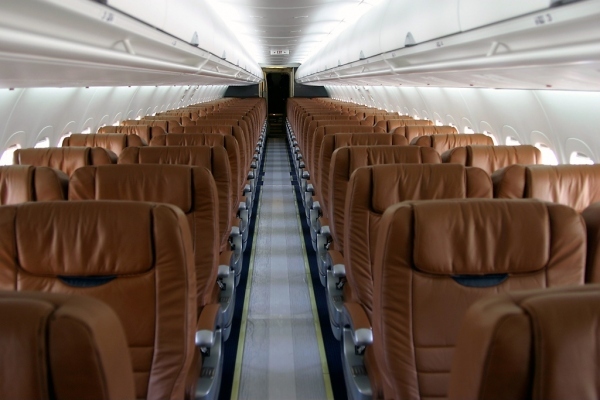 Below is a picture of what a Boeing 717-200 first class section should look like. The photo is of a Midwest Airlines (closed) 717 that has first class style seats through out the cabin. This is also shown on our Boeing 717-200 interior page. Above 717-200 First Class / Business Class Photo by Konstantin von Wedelstaedt on Wikimedia Commons. Photo (only) released under the GNU Free Documentation License, Version 1.2. Boeing B-717-200 First Class Cabin: the B-717 is used by many, including the FAA, to refer to the Aircraft. Boeing B712 First Class Cabin: B712 is the ICAO code for the airplane that is used by air traffic controllers, airlines and others. More information on this will be posted later. Boeing 717 First Class Cabin (with out the -200): Many call the 717-200 just the 717, which is the main aircraft program the plane is in (the only plane in the 717 program). 717 is also the IATA code for the jet aircraft.